William Morrow Paperbacks, 9780062283184, 384pp. 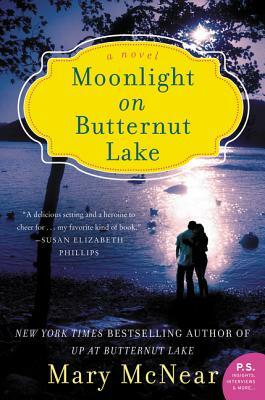 New York Times and USA Today bestselling author Mary McNear takes us home to Butternut Lake, where the townspeople are sure to look after anyone they consider their own. . ..
Mila Jones has fled the big city seeking a safe haven on the serene shores of Butternut Lake. Her position looking after Reid Ford is more than a job. It's a chance at a fresh start. And although her sullen patient does everything he can to make her quit, Mila refuses to give up on him. But Mila isn't the only one needing refuge. Haunted by the car accident that nearly killed him, Reid has hidden himself away. He wants Mila to just leave him alone. And he wishes the whole town would stop looking after his well-being. Against all odds, Mila slowly draws Reid out. Soon they form a tentative, yet increasingly deeper bond with each other, as well as becoming part of the day-to-day fabric of Butternut Lake itself. But the world has a way of intruding, even in such a serene place . . . and when Mila's violent husband forces his way back into her life, she and Reid are compelled to face down the past. Mary McNear, New York Times and USA Today bestselling author of the Butternut Lake series, writes in a local doughnut shop, where she sips Diet Pepsi, observes the hubbub of neighborhood life, and tries to resist the constant temptation of freshly made doughnuts. Mary bases her novels on a lifetime of summers spent in a small town on a lake in the northern Midwest.